You know that feeling when you read a book at exactly the right time? The sneaking suspicion you then have that it’s speaking directly to you and your problems (or the world’s problems!) and fate must have put it in your path? M.H. 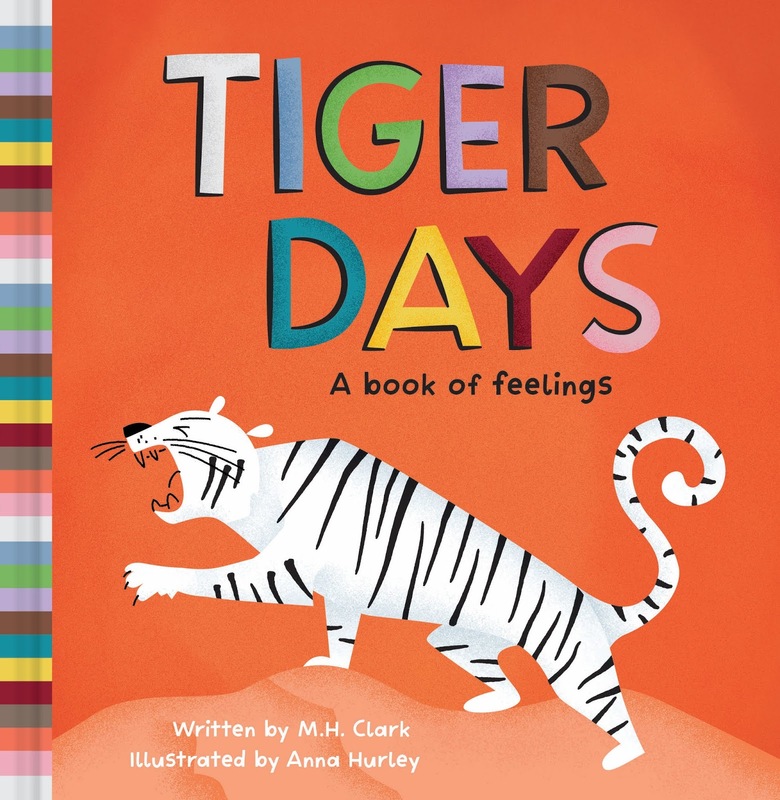 Clark and Anna Hurley’s picture book Tiger Days: A Book of Feelings has been that book for me this week. I had originally scheduled it for review on Monday, but the universe knew I needed to read it on Tuesday, and again on Thursday, and again today after hearing about the terrible tragedy in New Zealand. It’s a picture book, but a meaningful book is meaningful no matter the format or audience, and this one is delightful and indispensable. From tiger fierce to snail slow, there are lots of ways to feel and be. A walk through this colorful, rhyming menagerie helps young readers understand their feelings and the ways those feelings change. Children will recognize their own emotions on these pages—their enthusiasm, stubbornness, excitement, silliness, sadness, and strength. And they’ll come to see that, no matter how they act or feel each day, they’re always still themselves. 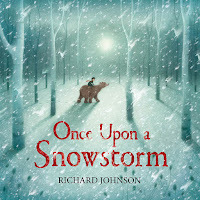 In this vibrant picture book, the first person narrator associates emotions with specific animals in rhyming text. If you’re having a Tiger Day, for example, it means that “…I want to climb. I’M WILD AND I’M FIERCE. I pace around and POUNCE and ROAR…” For me, today is a Fish Day, and I feel watery, just as the text suggests. Feelings are paired with not only animals, but also actions they might take while under the sway of those emotions. With themes of naming and acknowledging emotional states, self-acceptance, and recognizing that shifting feelings are okay (or even positive! 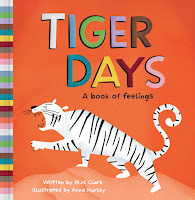 ), Tiger Days is a simple, accessible guide and/or introduction to complex emotions. It’s also a joy to read. 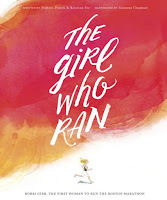 Illustrator Anna Hurley has created lovely art to go along with M.H. Clark’s delightful text, and it is here that I think the book takes a step up from good to excellent. The animals are rendered in cut paper-like blocks, with ink detailing and some shadowing, against lively colored spreads – one color for each kind of day. And there are a few intervening “day” pages without a signature animal that are turquoise with white crayon-effect illustrations that are a lot of fun for the eye and remind the reader that different types of feelings (and complex feelings!) are okay. Tiger Days’ text and illustrations are seamlessly integrated, entertaining, and poignant, and will be popular read after read. 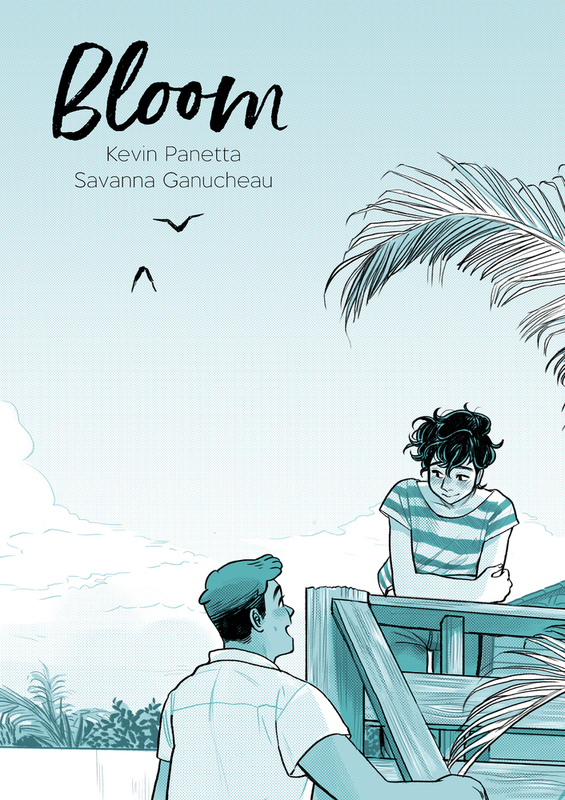 I would be remiss if I didn’t also take a moment to talk about the book design! This colorful title will pulled off the shelf time and again for its striped, multicolored binding. ALSO the dust jacket has a velvet touch effect for the title shadows and the tiger’s stripes! In other words, it begs to be petted! I can’t stop running my fingers over the texture, even now… so you KNOW it will be a hit with kids! Altogether, Tiger Days is a feast for the senses, and also a way to get in touch with them. A true book of feelings! All in all, Tiger Days will be a hit with both kids and adults, and I can’t wait to recommend it to all of the parents I know! Recommended for: anyone who is struggling to find the words to talk about complex emotions, and especially children ages 2-6. 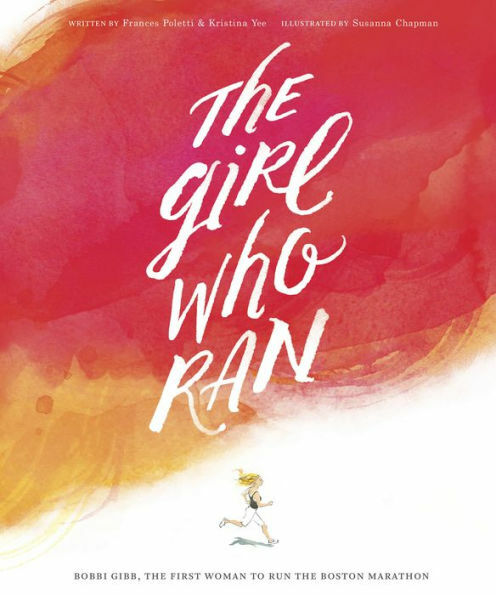 Perfect for story time, bedtime reading, and anytime reading if you like bright, fun books that encourage interaction and movement and have extra helpings of heart.